If you are already familiar with the WSO2 API Manager you would know that the API Manager provides the capability to apply throttling tiers to an exposed API. A throttling tier is an access limit which is applied to a given API subscription to make sure that API’s are not used over and above the expected level. WSO2 API Manager’s subscription plan is such that an API Subscriber can choose from a set of throttling tiers available to him when subscribing for an API. By default all the throttling tiers are available for all users. In real world an organization would want to have control over how users can subscribe and access their API’s. Opening up all the tiers to all users may not be acceptable. In order to address this concern API Manager provides a capability to assign roles to different throttling tiers hence only users belonging to a given role would have access to that particular throttling tier. Lets take the following example. You would have multiple user groups such as internal developers, registered external partners, and guest external partners. You would want to open up your API’s for these users but want to have different plans to these users. For this example we will only be dealing with the existing throttling tiers, based on this I will create the following mapping of user roles to tiers. These restrictions can be created from the API Publisher’s user interface. In order to do this, login into the Publisher console as a API Publisher. 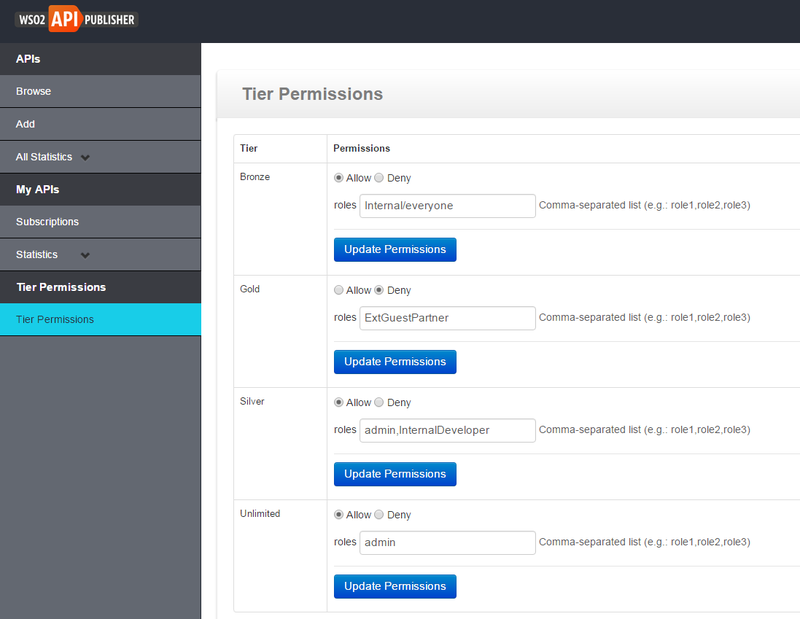 Once you are logged in you will see the ‘Tier Permissions’ link on the left hand navigation panel. Click on the this link. Once you are in the Tier Permission page set the roles to which you need to ‘Allow’ or ‘Deny’ to a given throttling tier. You can Create your own throttling tiers  and then define how these tiers should be made available to different application developers using the Tier Permission option provided available in the API Publisher.